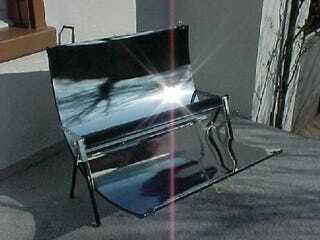 You only grill when it's sunny out anyways, so a solar-powered grill only makes sense. This isn't an electric grill rigged up with some solar panels either, it's a grill that's designed to use the heat of the sun to heat the surface of the grill without any gas or coils involved. It's equipped with a mirrored coating that focuses all the sun's rays toward a panel in the middle that acts as the cooking surface. It all looks like a really elaborate science fair project, but it's a pretty sweet idea and much cooler than your standard grill. It's available now for $240.